The Small Hive Beetle, Athina tumida, is a native of South Africa but is now being found in different parts of the world where it is causing great damage by destroying and contaminating colonies. In late 2014, SHB was discovered in southern Italy and Sicily and is now expected to move into many other parts of Europe. Vita supplies Beetle Blaster, an SHB trap. VitaFeed Gold will help keep colonies strong and healthy and lower the risk of a severe attack. Colonies invaded by SHB are commonly described as a mess. 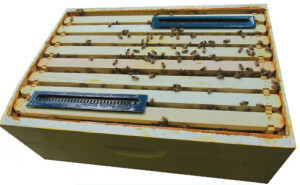 The SHB larvae tunnel through combs and cappings, eating and destroying them and often causing the honey to ferment giving off an orange-like smell. In very heavy infestations, bees simply abscond from the hive. Adult SHB can live for up to six months in a hive before their presence becomes obvious. The females will lay many eggs in cracks and crevices in the hive. The larvae then emerge to do the damage and before pupating leave the hive and bury themselves in ground nearby. SHB is a native of South Africa where it causes relatively few problems perhaps because of the particular hygiene activities of South African bees. SHB has spread to the USA (detected in Florida in 1998), Canada, Egypt and Australia (2002) and perhaps other countries through various methods including bee shipments, feral swarms, beekeeping equipment, comb and beeswax and imported goods such as fruit. The impact of the beetle on beekeeping in the USA has been huge, but, so far, less severe in other countries. Adults can survive for two weeks without food and water, seven weeks on used comb, and many months on fruit. Once in a hive, adult SHB can live for up to six months before their presence becomes obvious. The females will lay many eggs in cracks and crevices in the hive. The larvae then emerge to do the damage and before pupating leave the hive and bury themselves in ground nearby. The Beetle Blaster SHB trap will help control the beetle population, but there is no known way to eradicate SHB. VitaFeed Gold will help keep colonies strong and healthy and lower the risk of a severe attack. Weak colonies are much more vulnerable to attack by SHB.